Those living with macular degeneration can experience blurred vision or 'blind spots,' but a new virtual reality headset expands the user's peripheral vision and cancels out the blind spots. IrisVision relies on a Samsung Galaxy smartphone to record what the wearer sees and then it zooms in to make the blind spots disappear. The result: vision acuity goes from 20/400 to as high as 20/30. 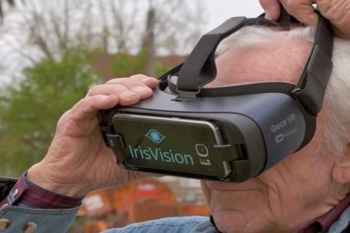 IrisVision was created by scientists at Johns Hopkins, The Chicago Lighthouse for the Blind, and UC Berkeley. "Everything around the blind spot looks, say, 10 times bigger, so the relative size of the blind spot looks so much smaller that the brain can't perceive it anymore," said Tom Perski at IrisVision. Please contact San Diego Center for the Blind to learn how we can help improve your life quality.